Overview description and discussion of the stratigraphic evidence for Period 2A and Period 2B are presented in separate sections. Detailed descriptions, site-wide and feature-specific plans, can then be accessed by following the hyperlinks highlighted within each of these texts. Period 2, spanning the mid-1st century BC to early/mid-1st century AD, encompasses the LPRIA origins and early development of the settlement up to and including apparent LIA/Early Roman transition c. AD 40-50. This period divides into two sub-periods. The form and nature of the earlier (Period 2A) settlement is less well understood, its remains being heavily truncated and obscured by subsequent occupation activity. However, it sees the establishment of an enclosed landscape across the gravel terraces. A potentially important component of this is a probable religious focus on the lower terrace - a precursor of the temple complex. The later Period 2B is marked by widespread and dramatic remodelling of the settlement and its hinterland that occurs around the time of the conquest (or possibly just before) and which lays down an infrastructure that dominates its morphological development into the Late Roman period. Metalled roads, occupation surfaces and more regular plot apportionment are imposed across the lower gravel terrace. While there are a few instances of reference to, and preservation of, important earlier settlement elements within the new layout (e.g. the religious focus), this transition period episode is predominantly one of significant change. The principal criterion for defining this earliest tangible settlement period is pottery dating. 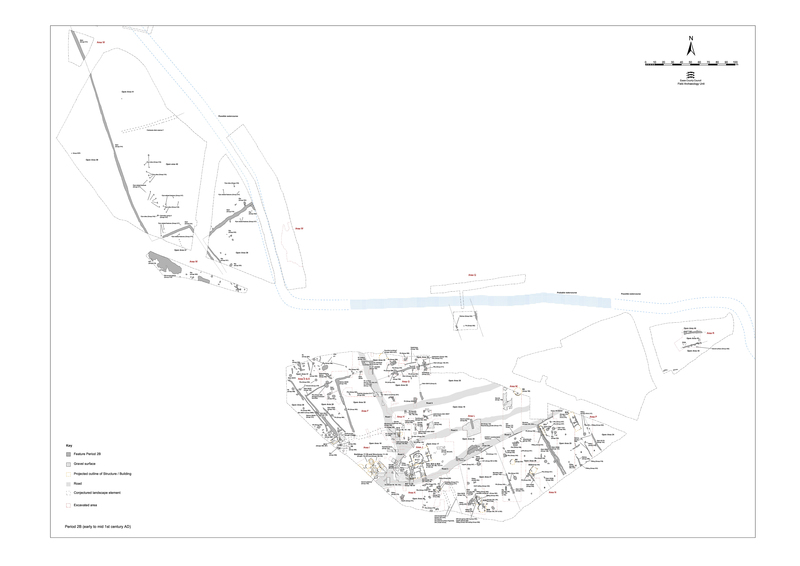 However, the archaeological evidence is extensive and complex and it became apparent during the course of post-excavation analysis that a major change in the layout and organisation of the settlement occurred within this period. As a result, a decision was made to subdivide Period 2, where possible, into two sub-periods - 2A and 2B. For some features the available evidence did not permit a distinction between 2A and 2B to be made. These contexts have been left within the general classification of Period 2. Sub-period 2A defines features that are more likely to be LPRIA in date. It covers the late 1st century BC and early 1st century AD. The archaeological evidence consists principally of boundary features, buildings and structures, and areas of pitting. However, apparent distributions and concentrations of Period 2A features may be as much a product of the localised nature of detailed archaeological excavation as of any real morphological traits within the settlement. In a few parts of the site there were two successive phases of Period 2A activity, with the dating evidence for the later phase being generally early 1st century AD. 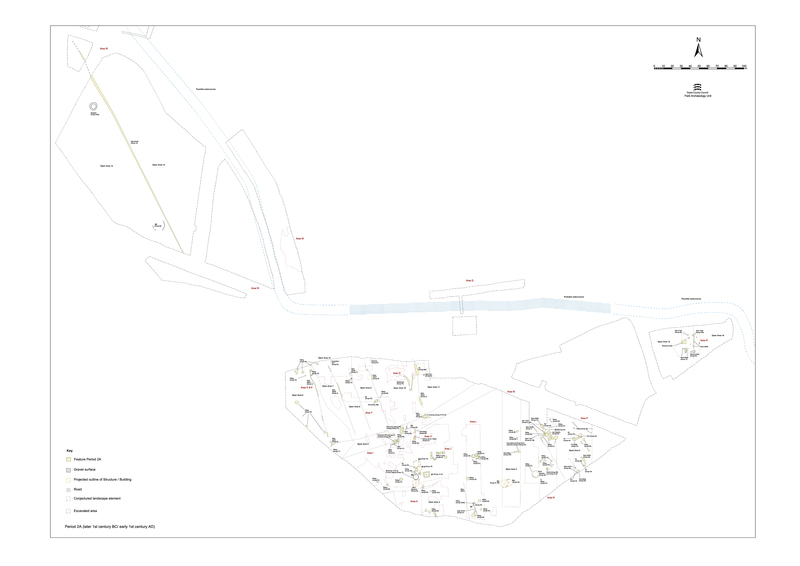 A summary view of the Period 2A settlement layout is shown on Figure 5. The pottery from the ditch fills suggests that the Open Area boundary ditches were filling up towards the end of the 1st century BC. However, the dating of the inception of these systems is more problematic. Finds retrieved from boundary ditches 25024, 25045 and 25238 may indicate that material was already starting to collect within them in the mid-1st century BC. It is also the case that the infilling of these ditches does not necessarily imply that these boundaries became redundant; any of the ditch lines may have been perpetuated by hedges, etc. Sub-period 2B is more likely to represent a transitional phase between the LPRIA and early Roman proper. It dates to the earlier to mid-1st century AD and includes a distinct episode of significant change around the time of the conquest that constitutes an often clear interface between sub-periods 2A and 2B. A summary view of the settlement layout in this phase is shown on Figure 6. Where appropriate, features accorded only a general Period 2 date are discussed and illustrated in plan alongside those of either 2A or 2B. Period 2 is by far the most complex of the periods considered. This complexity arises from a number of factors. Firstly, the dating is innately poor in terms of lack of changing chronological indicators within its finds assemblages. Secondly, this poorly dated sequence encompasses a massive reorganisation of the settlement at the interface between sub-periods 2A and 2B. In retrospect, each could well have been assigned to a separate period and are more-or-less regarded as such here. Thirdly, while in the central and southern zones of the site there was adequate stratification to permit the development of the site to be charted with some confidence, in the northern zone and the hinterlands of the site the combination of shallow stratification and poor dating evidence, exacerbated by a relatively low level of sample excavation, makes interpretation difficult.